I wanted to get this post out before the year gets any further (not farther) along. I am pleased to announce that the 2016 edition of U.S. Star Parties And Astro Events calendar is available on the CNYO website for your star party planning pleasure (and/or download). This is an as-complete-as-google-and-email-will-allow list of all of the star parties happening in the U.S. for the year (complete as of this posting, so check back to the main page often), including all of the events that were announced in 2015 but that haven’t had 2016 dates announced yet (and we’re keeping track of those links as well). This list, now maintained by Chuck Higgins of Mohawk Valley Astronomical Society and myself and is a continuation of the same original star party list compiled by the late-great Barlow Bob (shown at-play at right, who co-managed it with Chuck Higgins starting a few years back and before BB’s passing in 2014. 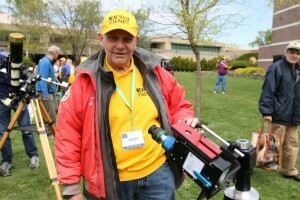 For those who don’t know about Barlow Bob, his contribution to NEAF in the form of the NEAF Solar Star Party (Astronomy Technology Today article downloaded from www.asgh.org), or his own solar astronomy outreach, please check out THIS LINK on the CNYO website. The image above comes from a nice remembrance at Stargeezer Radio). You can always find the page by hovering over the CALENDAR link the top menu list on the CNYO website. The excel file and list will be updated as we find new info for new events. If you want to add events to this list, please do so (contact Damian at info@cnyo.org, or use our CONTACT page)! We are also awaiting corrections, comments, new links, additional announcements, etc., from current items on the list – specifically the blue items at the bottom of the page. And What Is This Star Party Of Which You Speak? 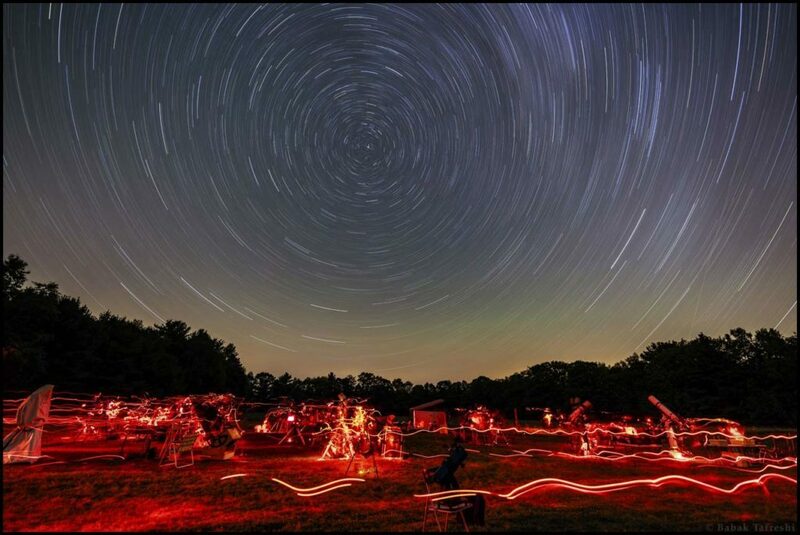 Very briefly – a chance for you to join many other enthusiastic amateur astronomers for a night of group star gazing, comparing eyepieces, assorted discussions, wandering around to see the variety of scopes in the community, and generally having a great time spending as much of the night as you can looking up. You should try to take in at least one each year! 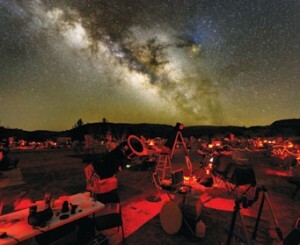 And might one of the events on this list be your first Star Party? Have you been kicked out of one lately and don’t know why? Do you want to NOT face the wrath of several hundred dark-adapted, caffeine-crazed astronomers in a single flicker of a flashlight? The I strongly encourage you to take a look at a few of the links below – which all cover proper Star Party Etiquette. As you will see, all the links basically say the same thing. With that kind of a consensus view, you know that we fellow attendees mean business. If you need more reading, just google star party guide. Attendees have a lot to say! I hope to see your dark, featureless outline at at least one of the events on the list. If you find one happening right in your own vicinity that you didn’t even know existed, thank Barlow Bob. A Few Quick Updates – MVAS Banquet (April 11), Baltimore Woods (April 17), NEAF Weekend (April 18/19), And Beaver Lake (April 23)! A few points of note for the next several days (and one from last week). 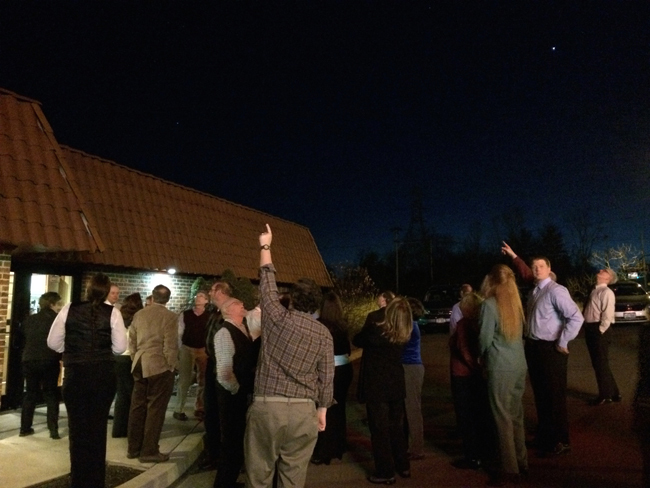 A pic from the Mohawk Valley Astronomical Society’s Annual Banquet this past Saturday, April 11th. As a satellite member of the group, I was fortunate to have left Syracuse early, discovering that there are TWO Daniele’s restaurants in the Utica/New Hartford area (and Google Maps only seems to know about one of them!). These events are always a great time, complete with great food, great company, and an engaging keynote for the evening. Due to the under-the-weather-ness of Joe Eakin from Colgate’s Ho Tung Visualization Lab, Colgate and MVAS’s own Dr. Thomas Balonek (the first MVAS’er to pay their 2016 dues!) gave a high-energy lecture on the scale of objects in the Solar System (and a ways beyond). After his first distance measure sent him out to the parking lot, he returned to send the rest of us outside to enjoy a few minutes of clear skies (the pic below, featuring the back half of CNYO’s own Christopher Shuck (and the front half of his watch)) before helping attendees get a handle on the relative sizes of objects and distances (for when the rest of us give similar lectures). It should also not go unnoticed that the club was still making note of Al Mlinar’s 100th birthday, complete with a sign-able, frame-able copy of Messier 100. Bob’s first (hopefully) comfortable evening of observing in Marcellus is happening this Friday (with Saturday as the weather-alternate) at Baltimore Woods, with Jupiter, Venus, and Saturn prime for viewing. As with all Baltimore Woods events, they ask that you RSVP for the event through their facility. Also note that Baltimore Woods is supported by hosting these events, so there is an associated fee for the event ($5 for BW members, $8 for non-BW-members). To RSVP, contact the BW office at (315) 673-1350 or info@baltimorewoods.org. Also, check back directly with Baltimore Woods about any cancellation and rescheduling. Ryan Goodson and I will be heading out Friday afternoon and will have with us nearly all of the remaining Stuventory for sale at the New Moon Telescopes booth (and will be accepting credit card payments!). Feel free to pass that info along to any NEAF attendees. And do make sure to stop by the NMT booth and also that of our friends (and fellow members) of the Kopernik Astronomical Society. We’ll have another announcement shortly, but our first session of the year at Beaver Lake will happen (weather pending) this coming Thursday, April 23rd (30th as the weather-alternate).